Protesters taking to the streets across Brazil during the upcoming World Cup risk facing indiscriminate police and military violence as the country steps up efforts to control demonstrations, Amnesty International said a week before the start of the tournament. “Brazil’s deficient policing record, reliance on the military to police demonstrations, lack of training and an atmosphere of impunity creates a dangerous cocktail in which the only losers are peaceful protesters,” said Atila Roque, Director at Amnesty International Brazil. 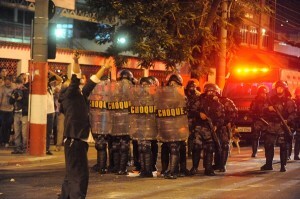 “The 2014 World Cup will be a crucial test for authorities in Brazil. They must use this opportunity to step up their game and ensure the security forces policing demonstrations during the tournament refrain from committing any more human rights violations,” said Atila Roque. Amnesty International’s report ‘They use a strategy of fear’: Protecting the right to protest in Brazil analyses the catalogue of abuses committed by the security forces in the past year. They include the indiscriminate use of tear gas and rubber bullets against peaceful protesters, arbitrary arrests and the misuse of laws to stop and punish those who had taken to the streets. These tactics which are expected to continue during the tournament. Today, Amnesty International’s activists in Brasilia are presenting federal authorities with tens of thousands of “yellow cards” signed by individuals from across the world as a warning that the authorities must respect the right to protest peacefully. “The world is sending a clear message to the Brazilian authorities: protesting is not a crime, it is a human right. Instead of using violence to crush protests, the government and the security forces have the responsibility to ensure people can speak their minds safely and without fear of injury or arrest,” said Atila Roque. Professional photographer Sérgio Silva, 32, lost his left eye after being hit by a rubber bullet at a protest against a bus fare hike in São Paulo on 13 June 2013. Silva, who is married with two children, now finds it very difficult to work. He never received an official explanation, apology or offer of compensation from the authorities. Military police units also used tear gas on peaceful protesters — in one case even firing a gas canister inside a hospital in Rio de Janeiro. Hundreds were also indiscriminately rounded up and detained, some under laws targeting organized crime, without any evidence that they were involved in criminal activity. Humberto Caporalli, 24, was arrested and charged under the National Security Law after taking part in a demonstration for education in São Paulo on 7 October 2013. At the police station, he was pressured to give the officers in charge the password to his Facebook account, so that they could check what he had been posting. He was then detained for two days before a judge granted him release on bail. Brazilian legislators are also debating a range of proposed laws that will likely further restrict the right to peaceful protest. A draft counter-terrorism law, currently before the National Congress, will establish a broad definition of terrorism that would, for example, include damage to goods and essential services as an act of terrorism. There is concern that, if passed, it could be misused against peaceful protesters. “As the world focuses attention on Brazil, authorities must publicly pledge not to use excessive force against demonstrators and investigate abuses. Anything less will be giving carte blanche to the security forces to commit more human rights abuses,” said Atila Roque.